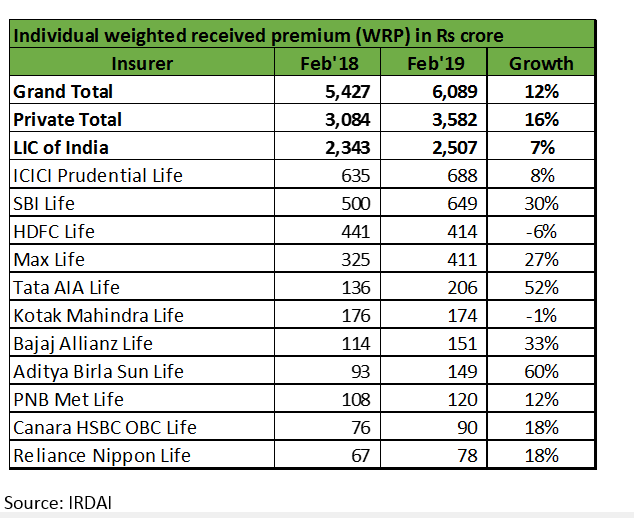 The unweighted total premium of the life insurance industry grew 33 percent year-on-year (YoY) to Rs 18,209 crore in February, as per data released by IRDAI on March 13. Private players’ unweighted total premium grew 17 percent YoY, much slower compared to the 42 percent YoY growth for Life Insurance Corporation of India (LIC). The more appropriate metric to look at is retail weighted received premium (WRP) which is a measure of premium received on individual products. It is the sum of the first-year premium on renewal policies and 10 percent of single premium policies. Private players’ individual WRP growth picked up in February 2019 to 16 percent YoY, while industry growth was 12 percent YoY. Private players like Birla Sun Life, Tata AIA and Bajaj Allianz exhibited robust growth. 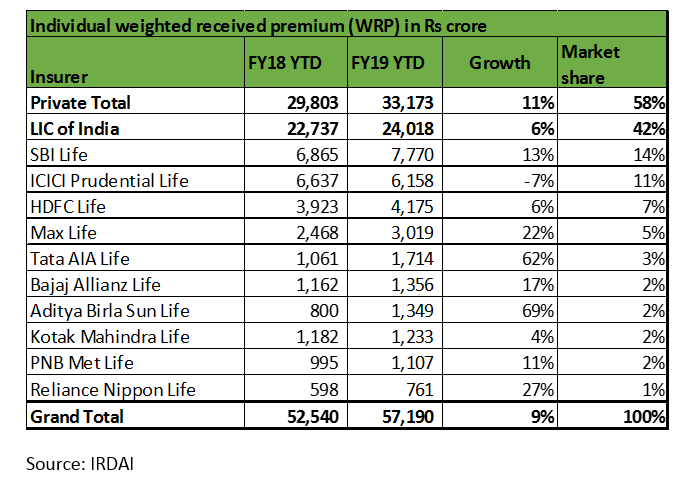 Among listed players, HDFC Life was the only large player that reported a decline in individual WRP by 6 percent YoY in February. However, in FY19 until February end, it has seen 6 percent YoY growth. On the contrary, ICICI Prudential life (ICICI Pru) witnessed 8 percent YoY growth in the month of February but its performance in FY19 is lagging behind and it has reported a decline. On an FY19 year-to-date (YTD) basis, SBI Life remains the largest private insurer in terms of total and individual WRP, followed by Icici Prudential Life. What explains ICICI Pru’s de-growth in the current financial year? ICICI Pru’s business model has historically focused on higher ticket size in ULIPs to tap into the investment wallet of affluent customers. The average ticket size of ICICI Pru’s savings products, or ULIPs, is high at Rs 180,000 per annum. With volatility in capital markets, the overall demand for these products has reduced, leading to a slowdown in this segment. Incrementally, the company is focusing on increasing its number of policies and offers monthly investments in ULIPs as an alternative to mutual fund SIPs. Since the plan was put into force in November 2018, it will take some time to yield results. So in FY19, topline growth is weak for ICICI Pru. That said, ICICI Pru’s improvement in business mix in favour of high margin protection business (9M FY19: 8.6 percent, 9M FY18: 4.1 percent) is very encouraging. However, the share of ULIPs in total new business APE at 81 percent makes it a highly cyclical stock. Consequently, the stock is penalised disproportionately in the current volatile markets. We see this as an opportunity for investors. The best time to buy a cyclical stock is during a downturn when it is beaten down. ICICI Pru’s stock is currently trading at 2.5 times trailing P/EV, a significant discount to HDFC Life’s. To be sure, we also like HDFC Life for its balanced product mix with a leading position in the protection business, expanding distribution network, high technology focus, product innovation and experienced management. But having acknowledged all these positives, the premium valuation of the stock leaves us with cold feet. HDFC Life is trading at 4.3 times trailing P/EV (price to embedded value), a significant premium to its peers. Overall, we are positive on the insurance sector and suggest investors participate in insurance growth story through ICICI Pru Life, available at a compelling price. Investing in HDFC Life does offer downside protection. But for long term investors who can stomach some volatility, ICICI Pru can offer reasonable upside as well.